The basic structure of a polymer is a chain. 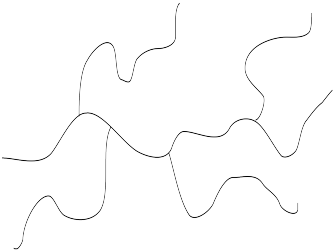 The chain is formed by the backbone of the polymer. It may be decorated with pendant groups, such as methyls in polypropylene, chlorines in polyvinyl chloride or phenyls in polystyrene, but the basic structure is like a long string. Sometimes, the architecture of a polymer can be more complex than that. For example, low-density polyethylene has branches coming off the main chain. Consequently, it is described as a branched polymer. 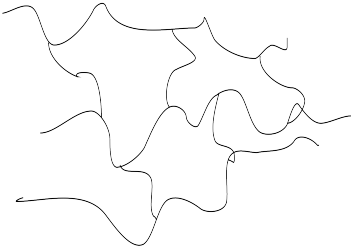 In some cases, branching is so extensive that the polymer does not resemble a chain at all. Some of these highly-branched polymers are called dendrimers. Dendrimers are tree-like structures that branch out in all directions from a central point. Viewed from a distance, a dendrimer would have an overall shape that is more like a fuzzy ball than like a coiled chain. 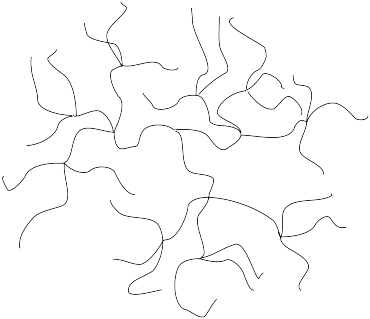 If the branches on one branched chain connect directly to other chains, then the polymer is said to be crosslinked. Crosslinked polymers can have extra strength and rigidity because they are less flexible than polymers in which the chains are able to move independently. However, just the right amount of crosslinking can make a polymer more elastic, making it bounce back to its original form after it is flexed. Crosslinking can actually be of two different types: "chemical" or "physical". Chemical crosslinks are permanent covalent bonds between the chains. Physical crosslinks are more temporary; they are formed by strong intermolecular attractions, such as hydrogen bonds, between chains. Choose an architecture that would work well for each of the following applications, and explain your choice. The structure of polymers can vary in how their chains are arranged. Additional structural complexity arises if the polymer is a copolymer. Regular polymers are made from one kind of monomer. Copolymers are formed from two different monomers. If there are two different monomers, they may be arranged in different ways along the chain. Maybe the two monomers simply alternate, one after the other: that's called an alternating copolymer. Maybe they are distributed at random: that's a random or statistical copolymer. Maybe they are clustered in two separate groups: that's called a block copolymer. 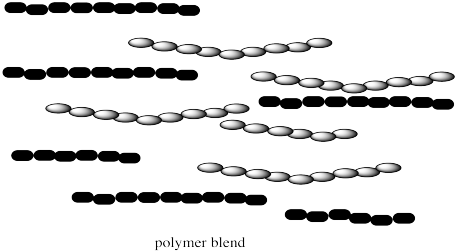 These copolymers are different from polymer blends. Polymer blends are just mixtures of two different kinds of polymers. Both polymer blends and copolymers are important. Either one might allow different properties of each polymer, such as strength and flexibility, to be brought together in one material. There are different kinds of block copolymers, depending on how the blocks of each monomer are arranged in the chain. 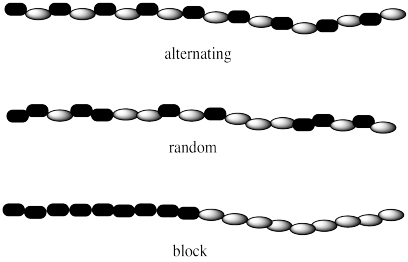 The simplest kind of chain would contain one long block of the first monomer followed by one long block of the other. That's called a diblock (or AB diblock) copolymer . 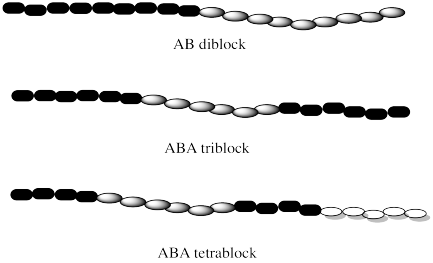 If two blocks of the same polymer are found on the ends, with a different one in the middle, that would be called an ABA triblock copolymer. If there were three different blocks from three different monomers, we would have an ABC triblock copolymer instead. There are lots of possible variations. Sometimes, the blocks in a block copolymer are not found along the chain. For example, in some cases, the entire backbone may be composed of one monomer, with pendant chains attached to the backbone. A material with this type of architecture is called a graft copolymer, or sometimes a comb or a brush copolymer.